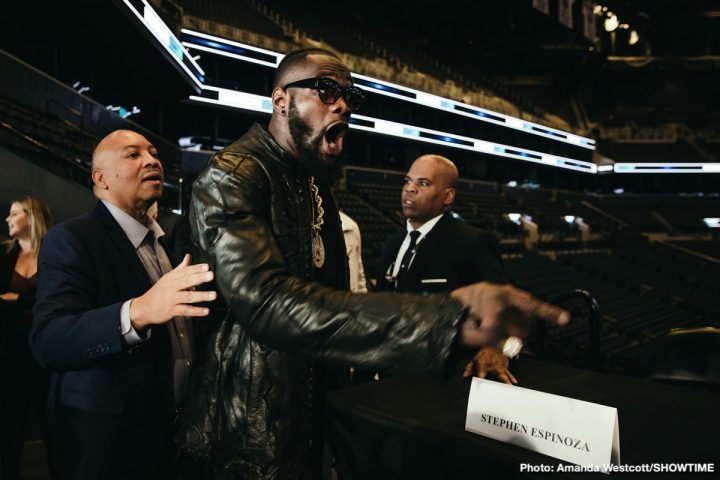 By Mike Smith: The much talked about fight between WBC heavyweight champion Deontay Wilder and challenger Dominic Breazeale are now a done deal for May 18 on regular non-pay-per-view on SHOWTIME on Premier Boxing Champions at the Barclays Center in Brooklyn, New York. Tickets for the Wilder-Breazeale fight will go on sale this week on Friday, March 22. This is a compelling fight between two giant 6’7″ heavyweights, both with excellent punching power, and both U.S Olympians in the past. A lot has been going on in Wilder’s life lately. He’s had offers to sign with Top Rank Boxing and DAZN, but he’s chosen to stay with Showtime. Had Wilder signed with Top Rank, it would have setup a rematch with Tyson Fury. Signing with DAZN would have setup two fights against IBF/WBA/WBO champion Anthony Joshua. Wilder reportedly was offered over $100 million for a three-fight deal with DAZN. For Wilder to turn down that kind of money, it suggests that he believes his two fights against Joshua will make more on pay-per-view than what he would get signing with the streaming giant. Wilder, 33, will be making his ninth defense of his World Boxing Council heavyweight title he won four years ago in beating Bermane Stiverne by a 12 round unanimous decision in 2015. Wilder recently fought to a controversial 12 round draw against lineal heavyweight champion Tyson Fury on December 1 in a fight that many boxing fans thought Deontay should have lost. Since he knocked Fury down twice in the fight, it made it tough for the judges to give Fury the win. “I’m very happy that I get a chance to get a mandatory out of the way, because I consider mandatories like flies buzzing around my head,” said Wilder in a news release. “They bother me. I’m busy. I have things that I want to do. I want to get him out of the way. I’m about to smash this fly…I haven’t been this excited about destroying an opponent since Bermane Stiverne,” an energized Wilder said. This fight could be a lot tougher than Wilder thinks it’ll be. Breazeale has respectable punching power, and he’s won his last three fights since losing to Anthony Joshua by a 7th round knockout in 2016. A highly intelligent fighter, Breazeale has matured since his loss to AJ, and he seems to have developed toughness from that fight that he’s used in winning his last three matches against Carlos Negron, Eric Molina and Izuagbe Ugonoh. The fight against Ugonoh was a competitive won in which both fighters hit the canvas. Breazeale was forced to get up off the deck in the 4th round to come back to to drop the hard hitting Ugonoh twice in the 5th round to get the knockout. “I want that WBC title. What I bring to the fight is excitement and consistent action,” Breazeale said. “I’m going to bring the action all night. I’m not scared to stick my nose out there and look for the big shot. I know the big shot is coming as long as I set it up the right way,” Breazeale said. This fight could be considered a 50-50 affair. Wilder obviously will be a big favorite going in, but don’t be surprised if Breazeale pulls off the upset if he’s able to connect with some of his hard right hands and left hooks. The shots that Breazeale landed in stopping the 6’5″ Ugonoh (18-1, 15 KOs) two years ago in February 2017 are big enough to get Wilder out of there. If Wilder loses this fight, he’ll have thrown away a lot of money he could have made had he signed with DAZN, and taken the two fights against Anthony Joshua. A lot of boxing fans believe that Wilder chose not to sign with DAZN out of fear of facing the hard hitting Joshua, who is almost as tall as Wilder at 6’5″, but is a lot heavier than him at 245 lbs. Wilder’s weight has been dropping in the last four years since weighing in at 229 lbs against Eric Molina in June 2015. In Wilder’s last fight, he dropped down to 212 lbs for his title defense against Tyson Fury last December. This is two lbs lighter than the 214 lbs that Wilder weighed for his fight against Luis Ortiz. With the way that Wilder continues to lose weight, it’s quite possible that he’ll be lower than the 212 for his fight against Breazeale, who weighed in at 256 lbs for his last fight against Carlos Negron last December. Wilder being outweighed by 40 lbs by Breazeale might be a big problem for him. Breazeale does well against smaller, lighter fighters than him. It doesn’t matter how fast Wilder is. If he lacks the size to deal with all the weight and size that Breazeale has, it’s going to be difficult for him to win this fight. Wilder was almost knocked out by 6’3″ 240 lb Luis Ortiz last year. Had Ortiz not punched himself out while trying to knockout Wilder in the 7th round, he probably would have beaten him. Ortiz gassed out and stayed tired after the 7th, and this enabled Wilder to come back and knock him out in the 10th.